During his second State of the Union speech, President Donald Trump said the US would be in a major war with North Korea if he hadn't been elected. President Donald Trump appeared before a divided Congress for the first time on Tuesday appealing to lawmakers' sense of unity at a moment of deepening partisan spite. 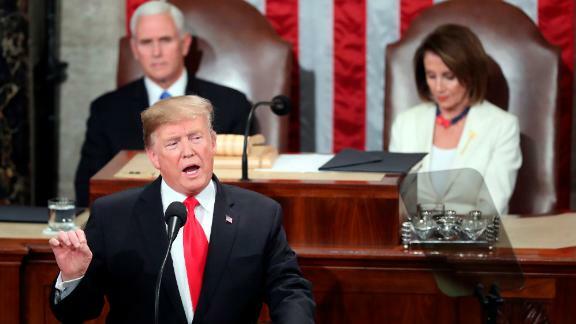 "An economic miracle is taking place in the United States -- and the only thing that can stop it are foolish wars, politics or ridiculous partisan investigations," Trump said, as Pelosi visibly scoffed behind him. Even most Republicans sat silent. "If there is going to be peace and legislation, there cannot be war and investigation. It just doesn't work that way!" Even as he declared that the "state of our union is strong," the President once again sought to portray the situation on the southern border as an "urgent national crisis" that he said threatened the security of "all of America." He renewed his demand for a border wall in a lengthy and severe section of his speech devoted to immigration. But President's track record indicates the luster of unity is unlikely to last: Many of his past attempts at bipartisanship have quickly evaporated amid tweeted barbs. Trump made clear he is not wavering on his demand for a $5 billion border wall -- which Democrats have declared a nonstarter -- even as he pulled out rhetorical flourishes envisioning a post-partisan Washington. After a 35-day government shutdown triggered by his demand for a border wall, the President once again called on Congress to fulfill his request for border security, including a wall, and flicked to the next government funding deadline in 10 days. "Now is the time for Congress to show the world that America is committed to ending illegal immigration and putting the ruthless coyotes, cartels, drug dealers and human traffickers out of business," Trump said, framing border security as a "moral issue." Trump also touted his deployment of additional troops to the border and once again called attention to the latest caravan of migrants making its way toward the United States, drawing hoots of disapproval from Democrats. Without evidence, Trump accused Mexican cities of bussing undocumented immigrants to the southern US border. Beyond immigration and border security, Trump also homed in on the issue of abortion with rhetoric that White House aides previewed as an attempt to jolt enthusiasm among his evangelical base. Bills in New York and Virginia to allow late-term abortions became a political rallying cry for evangelical conservatives in recent weeks, and Trump drilled down, accusing Virginia Gov. Ralph Northam of saying "he would execute a baby after birth." Trump appeared to be referring to controversial comments Northam offered on a radio show in which he described the birth of a "nonviable" fetus or infant with "severe deformities." Northam was referring to the decision between a physician and parents about whether to resuscitate an infant in that condition. "The infant would be delivered. The infant would be kept comfortable. The infant would be resuscitated if that's what the mother and the family desired. And then a discussion would ensue between the physicians and the mother," Northam said. The governor's office said Northam's comments were taken out of context and said: "The governor's comments were limited to the actions physicians would take in the event that a woman in those circumstances went into labor." The President was confronted by a Democratic Party invigorated by its own base, as dozens of female Democratic lawmakers donned white in honor of the women's suffrage movement. Those lawmakers stood stone-faced during the overwhelming majority of Trump's speech and quickly shuffled out of the chamber as Republican lawmakers cheered his remarks. But when Trump touted gains by women in the workforce and in Congress, those women lawmakers in white began to whoop and cheer -- though they appeared to be congratulating each other, not applauding the President. Trump also used his State of the Union Address to announce his forthcoming summit with North Korean leader Kim Jong Un. Trump and Kim will meet February 27 and 28 in Vietnam, Trump announced. The President also talked up his efforts to accelerate the end of US troop presence in Syria and Afghanistan. "It is time to give our brave warriors in Syria a warm welcome home," Trump said, noting the US would continue to work to "destroy the remnants of ISIS." And he touted the peace talks in Afghanistan to end the US' longest-running war, saying he has "accelerated" negotiations to reach a political settlement. "Our troops have fought with unmatched valor -- and thanks to their bravery, we are now able to pursue a political solution to this long and bloody conflict," Trump said. Pointing to the conflict spanning nearly two decades, Trump said the US must at least try to reach a peace settlement. The annual address from the US Capitol is one of the most familiar set pieces of the presidency, and one of the most watched. Prior to the speech, Trump believed it would lend his arguments credibility at a vulnerable moment, as his poll numbers trend lower and Democratic challengers -- many of whom were in his audience -- begin to announce their intentions. Polls show Trump is unpopular among most Americans and a monthlong partial government shutdown over securing funds for the wall only damaged him further. But there were no signs he is backing off his demands during Tuesday's speech. They have until February 15 to reach an agreement. It now appears more likely he will declare a national emergency on the southern border as a way to secure the wall money without congressional approval. Aides debated whether to announce the move during the State of the Union but ultimately decided against it. Last week Senate Majority Leader Mitch McConnell warned Trump during a private meeting that such a move would be unwise. Ahead of the address, Trump was sniping at Democrats who dismissed his calls for unity. Senate Democratic leader Chuck Schumer accused the President of "blatant hypocrisy" in remarks on the Senate floor Tuesday.